THE BRITISH RAILWAY STORIES LTD: "Thompson A2/1 from a Bachmann V2 & Graeme King Parts - Part 4"
"Thompson A2/1 from a Bachmann V2 & Graeme King Parts - Part 4"
Both painted in exactly the same manner and with the same white undercoat. What gives? The A2/2 is darker! I am in two minds still. Having talked it out with Mick at length via PM, I'm reluctant to remove such a smooth finish, but the colour is just wrong. It's far, far too dark. The A2/1's dome came out okay so I am scratching my head as to why. The tender has had some further changes. 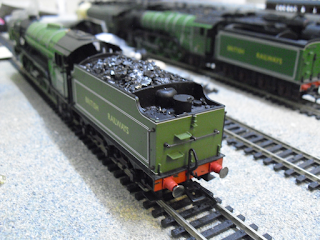 Here we can see that I've chopped off the moulded coal, keeping the rear wall in the tender, filling it instead with real coal. This will look much less shiny when weathered I suspect! I've gone off two photographs of 60508 at King's Cross, and filled the tender to the brim. The smaller B1 tenders were not well liked on these class of engine, and I suspect that was down to both the lack of a tarpaulin at the cab, and the lack of water or coal capacity, for what was an economical machine but only on the heaviest of passenger and freight trains. There's interesting lb per mile statistics for this particular engine in a set of trials, which can be read in British Pacific Locomotives by Cecil J. Allen, or East Coast Pacifics at Work by Peter Townend. Whatever your take on the A2/1s, it's clear that the "orphans of the storm" were moderately successful when employed on the heaviest of trains but lacking in the refined qualities the A3s, A4s and A1s possessed. 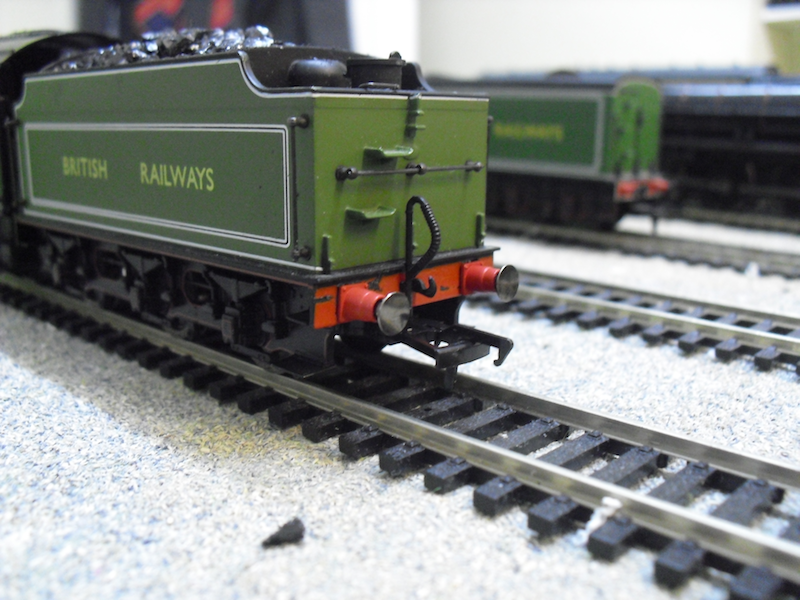 A further modification was to the buffers; the Bachmann ones were poor in comparison to these Hornby B1 buffers, which are available from Peter's Spares on eBay, and were duly replaced. The bufferbeam will have a bit of filler, wet'n'dry paper, and some red paint added before too long to complete the job. The cabside numbers have been added, with a coat of Johnson's Klear used to seal them. 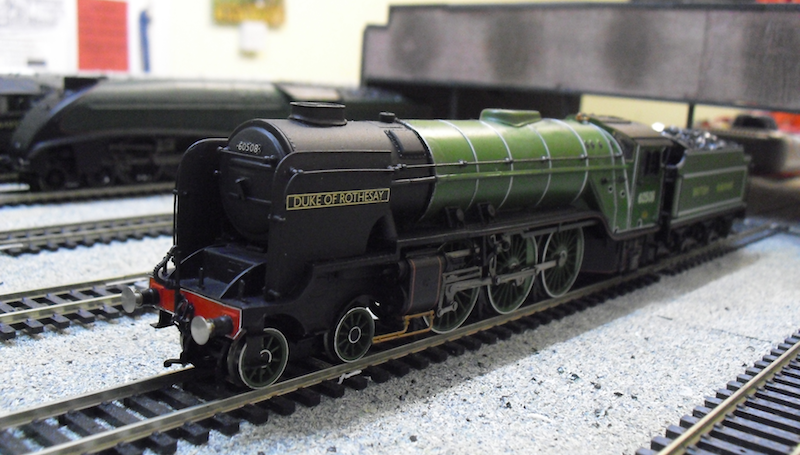 I am debating whether to just say "sod it" and go commission a set of transfers for the curly 6 - from the look of things, I will need approximately 30 of these numerals to renumber my fleet, which includes many of the apple green Pacifics which had them. This curly 6 was created by cutting ans shutting a number 5 from a Fox Transfers sheet, a method tried and tested with much success elsewhere on RMweb. It is a very good tip. So that, bar weathering, is more or less that. 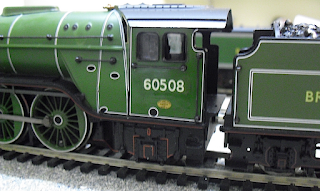 The one thing standing out is the cartazzi wheels; they haven't been added yet as I have not had enough time to devote to examining my chassis and working out the best way of attaching them. I suspect Graeme King's excellent A-frame idea he applied to one of his A2/3s may come in handy in due course. So for the moment, that's yer lot with Thompson A2/1s. I'll weather it once I have time to get the airbrush and spray booth out, but from today until next week I'll be away from home mostly, so no chance to finish it off completely for a while yet.